Sever’s disease (or heel pain) is painful inflammation at the back part of the heel bone where the Achilles tendon attaches to it. It is seen in active growing children or adolescents, who are commonly involved in running or jumping sports. Most frequently it occurs in 9–12-year-old boys and 8–12-year-old girls, although can be seen in children as young as 6 years old. It is made worse by sports, especially those involving jumping or running. The pain generally improves somewhat with rest and becomes worse after activity. It may occur in one heel or both. The pain can be brought on when the clinician forcefully pushes the foot upward at the ankle (dorsiflexion), when the affected area is pressed for examination or when the child is made to perform toe raises on their own. In long standing cases a bump may be felt at the back of the heel bone (calcaneus). 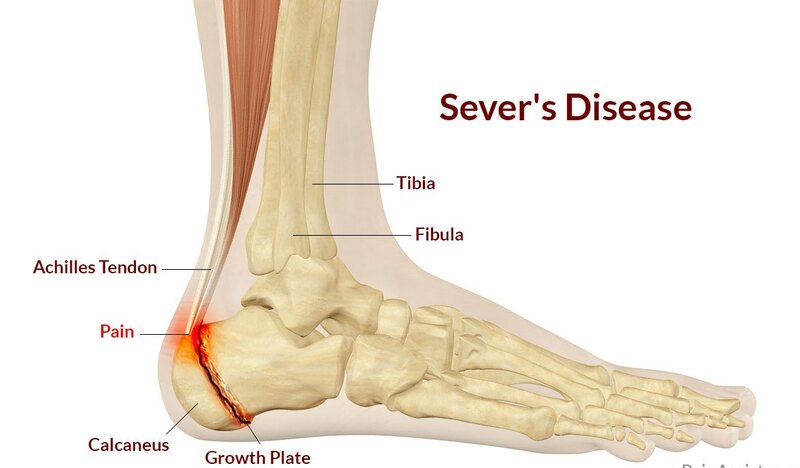 Sever’s disease is thought to be caused by repetitive trauma to the back part of the heel bone brought on by the pull of the Achilles tendon on its attachment point onto the heel bone. Increased pressure on the heel where it contacts the ground can be a predisposing factor for Sever disease. Tightening and shortening of the calf muscles resulting in difficulty in dorsiflexion (pointing the foot upwards), is another predisposing factor. How important is it to treat this condition? Sever’s disease, despite the dreadful connotations of the term ‘disease’, is a self-limiting condition, as children grow out of it. However, while it can get better with time, it is hard to predict exactly how long it will take for the condition to resolve by itself. It could be up to two years or more during which time it can cause significant pain and suffering to the child and cause participation and performance limitation in sports that the child enjoys. If left untreated it can considerably limit even simple activities of daily life. Very rarely untreated Sever’s disease can lead to fractures of the heel bone where a piece can break off from the back part at the point of attachment to the Achilles tendon. How can a podiatrist help children and adolescents with this condition? At The Foot Group we see this condition regularly and assess this condition by performing a detailed biomechanical examination of the feet and ankles. X-rays and MRIs are not routinely required and the diagnosis is based on clinical history and biomechanical examination, but some patients may be referred for these investigations in case other conditions or complications are suspected. Sever’s disease is managed using custom-made foot orthotics which conform to the feet and form an interface between the ground and the foot. This improves foot function and assists in rectifying abnormal gait patterns and helps in pain alleviation. Stretching and strengthening exercises along with appropriate footwear will also help alleviate the condition.